This quaint relaxing retreat comfortably sleeps 6 adults in 3 bedrooms and 2.5 baths with off street parking for 4+ vehicles. The sunny fully equipped kitchen makes preparing a traditional low country meal a pleasure and a full size washer and dryer make keeping up with the laundry a breeze. It has a wrap around porch. 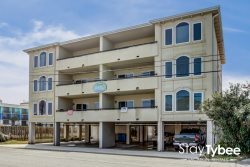 Located within easy walking distance to the beach, several restaurants and shopping. "Jones Beach House" offers a lovely homespun atmosphere with vintage antiques and charming handmade quilts. *Please note that the description above is subject to change. Please contact our rental company directly to confirm the rates, availability and amenities. The Stay Tybee staff I dealt with from beginning to end were amazing! Thank you! 210 Jones was a great house for our family gathering!! Had everything we needed!! It was excellent. Very clean and in great shape. Couldn't have asked for more.